In these cooler Fall days, I tend to crave comfort foods more often. Meat dishes, hearty pastas, and savory bean soups make their way onto my dinner menu. 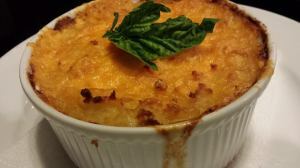 My Succulent Chicken Shepherds Pie is a good way to use leftover mashed potatoes and baked or braised chicken. With the addition of my apple cider pan gravy, it’s a Taste of Fall. 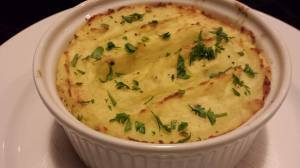 Shepherd’s Pie has a history that began in the late 1700s and early 1800s in Ireland. It was originally known as Cottage Pie and later called Shepherd’s Pie. It’s a “pie” that is traditionally made with lamb or beef as the base, combined with vegetables, topped with mashed potatoes and baked to a golden brown. Meat Pies are slightly different in that they use pastry as a covering instead of the mashed potatoes. Meat Pies date back to 9500BC according to Wikipedia.org and were popular with the Greeks and Romans. I like to use cooked chicken in my shepherd’s pies. 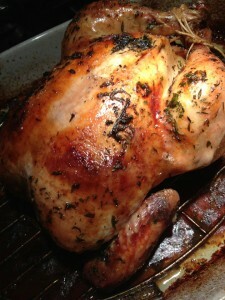 Smoked chicken is another savory option. You can use chunks of cooked meats such as roast beef, turkey breast, pork shoulder or lamb. Ground meats are an easy option. Try cooked ground lamb, beef, turkey, chicken, or pork. Use your favorite diced cooked vegetables such as carrots, peas, onions, mushrooms, green beans, corn, lima beans or tomatoes. 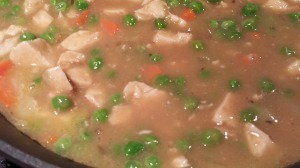 You could use leftovers from my TV Dinner Peas and Carrots if you’ve made them recently. No need to pre-cook them so you can skip that step. 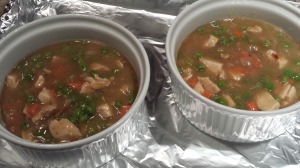 My filling for this particular recipe includes the chopped chicken as well as cooked peas, carrots, and onions in a sweet and savory apple cider pan gravy. The crowning glory on this dish is the crispy covering of mashed potatoes. 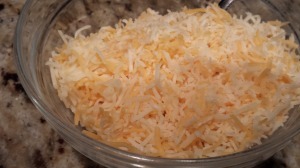 You can top the mashed potatoes with shredded cheese, mix the cheese into the potatoes before spreading over the filling, or omit the cheese all together. So how to get started? 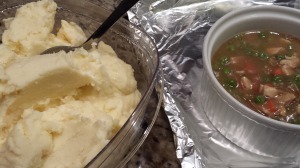 Make a batch of my Easy Mashed Potatoes to start. You’ll need about two cups of mashed potatoes. Also, you’ll need to make my apple cider pan gravy. The gravy recipe is included below. I prefer to use apple cider in my gravy rather than the traditional Guinness beer. Have some shredded cheese ready. You can use sharp cheddar or a combo of your favorite cheeses. I like to sprinkle some shredded Parmesan on top of the shredded cheese to crisp it up a bit. Dice some onion and carrot. 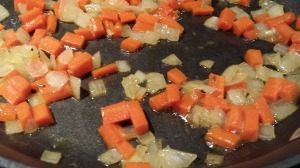 Saute them in some olive oil until the carrot softens and the onion is translucent. 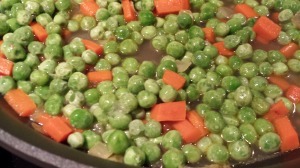 Add some frozen peas and stir. Add some apple cider pan gravy and simmer a few minutes to warm through. Pour the filling into the baking dish(es). Bake for 20 – 30 minutes at 350 degrees Fahrenheit until the filling is bubbling and the potatoes have browned. 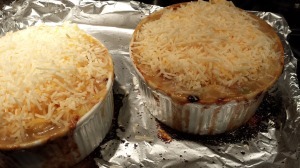 Remove the Shepherd’s Pie from the oven and top with the shredded cheese. 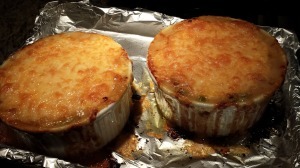 Return the Shepherd’s Pie to the oven and broil until the cheese melts and browns a bit. 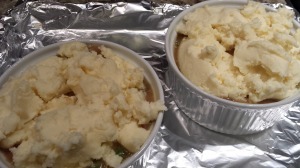 Remove the Shepherd’s Pie from the oven and let cool a bit before serving. Also, this is my 200th post on A Food Lover’s Delight. 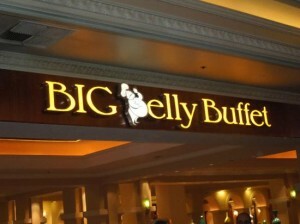 Thanks to all of you for continuing to visit and for following my tasty adventures! Over low heat, melt the butter in a non-stick chef’s pan. 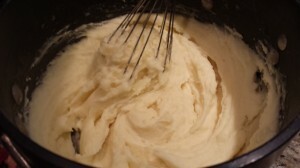 Whisk in the flour and keep whisking a few minutes until the flour and butter combine and cook a bit. Whisk in the broth/stock and apple cider. Simmer until the gravy thickens, whisking periodically to ensure the gravy doesn’t stick to the bottom of the pan. Season with salt and pepper. Makes about 2 cups. 2. Butter one or more baking dishes. 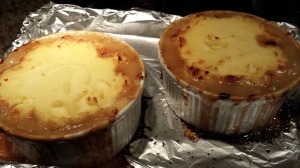 I like to make “individual” Shepherd’s Pies so will use several ramekins. 3. Make the mashed potatoes and the pan gravy and set aside. 4. In a skillet, over medium heat, warm the olive oil. 5. Saute the onion and carrot until soft. 6. 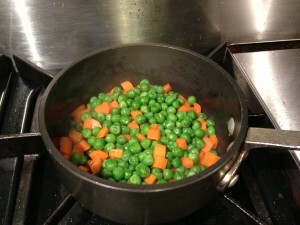 Add the peas and stir to warm them. 7. Add the chopped chicken and cook for a few minutes. 8. 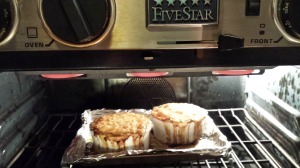 Add the apple cider pan gravy and simmer the filling for 5 minutes to warm through. 9. Pour the filling into the baking dish(es). 10. Top the filling with dollops of mashed potatoes, smoothing the potatoes a bit to ensure about a half inch thick coverage. 11. Bake the Shepherd’s Pie for 20 – 30 minutes or until the filling is bubbling and the potatoes have browned. 12. 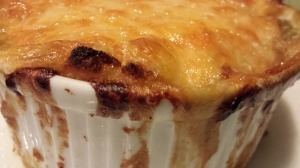 Remove the Shepherd’s Pie from the oven and top with the shredded cheese. 13. 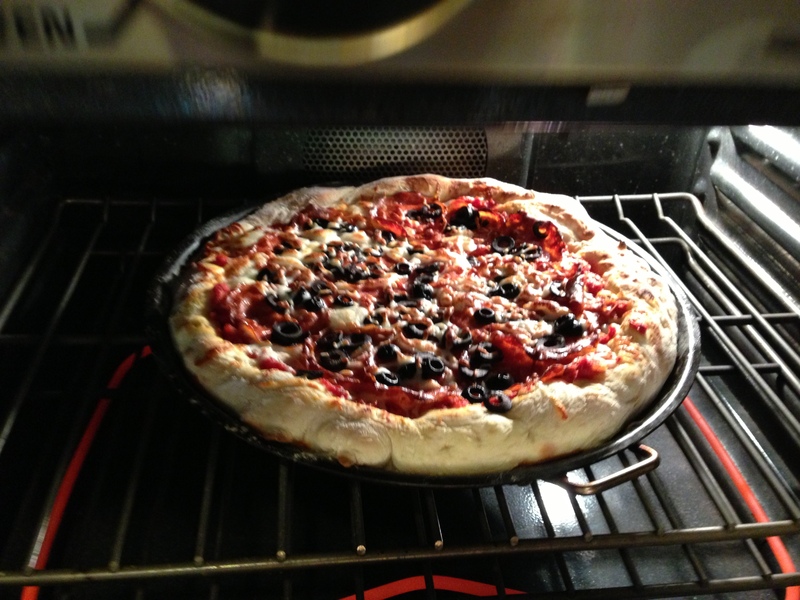 Return to the oven and broil until the cheese melts and browns slightly. 14. Remove from the oven and let cool for a bit before serving. 15. Either serve the individual ramekins or spoon out onto plates. Enjoy! Serves 4 as a main course. 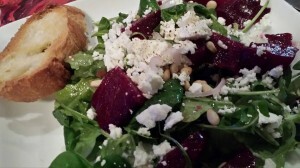 Offer with a side salad such as my Pretty Pear Salad with Goat Cheese and Cinnamon Pecans or my Special Bittersweet Salad. Both are nice Fall and Winter salads. 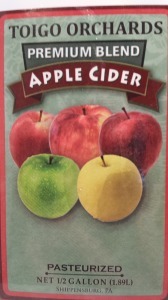 In keeping with the cider theme, a sparkling cider goes nicely with this dish. 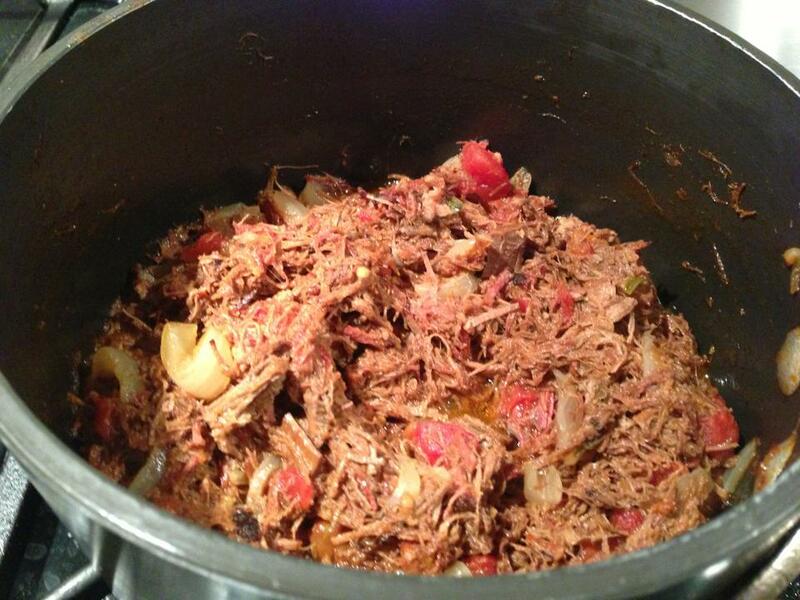 Variations: Use beef, lamb, pork or smoked chicken in this dish. Add your favorite vegetables. Omit the cheese or use fat-free cheese if you are watching your fat and calorie intake. Omit the apple cider if using beef in this dish.